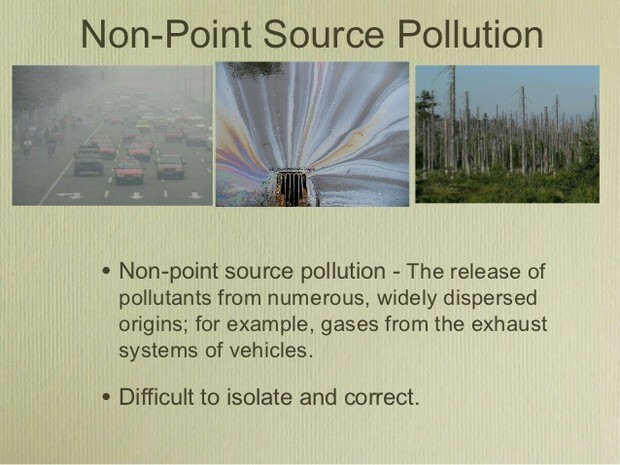 A chemical or material carried into an ecosystem through water runoff or other indirect pathways that causes damage and malfunctions within the ecosystem. This includes fertilizer from agricultural fields and surface mining operations. My class and i went on a field trip to Onandaga Lake and learned how non-point pollution is polluting Onandaga Lake because of all the farms and animal waste. My class and i also visited beak and skiff. We noticed that there are more apples on the trees because beak and skiff is right on the Onandaga Lake watershed. So all of the waste from the rotting apples are getting into the water of Onandaga Creek and then the water is going to flow down and then get even more polluted by the mudboils. Then its going to get polluted by more farms and then the water finally hits Onandaga Lake.